67% of the population in Ferguson is black. Blacks account for 85% of vehicle stops. Blacks account for 90% of citations. Blacks account for 93% of arrests. Blacks account for 95% of “Manner of Walking in Roadway” charges. Blacks account for 94% of all “Failure to Comply” charges. Nearly 90% of documented force used by FPD officers was used against African Americans. Blacks account for 100% of dog bites. Blacks account for 96% of cases where someone was arrested by FPD only because of an outstanding municipal warrant. So, from reading these numbers, it is clear that there is a very strong racial bias. But, even though Scott and I are both used to working with numbers because we work in a very quantitative corner of the biological sciences, we realized that it was hard to wrap our heads around those percentages. We wanted to know: how much more likely is a black person to be arrested? How much more likely is a black person to encounter use of force by the police? In other words. How bad is the situation really? Just from the percentages, this is hard to know. I asked 4 of my students today: if blacks account for 85% of the vehicle stops in Ferguson, how much more likely is a black person to be stopped compared to a non-black person? They guessed about two times as likely. I’ll show here, that it is much closer to three times as likely. It’s even worse than it sounds. To calculate how bad the situation really is, we need to do some math. First of all, in stead of thinking of 67% of the population being black, let’s just look at the actual number of people. Ferguson has a population of around 21,000, so that means that there are 14070 black people and 6930 non-black people in the city. Now, let’s look at the vehicle stops. The DOJ report says that 85% of the vehicle stops involved black drivers. The DOJ report actually gives the numbers (although we could calculate without those, see next paragraph). So, we now know that 9,875 vehicle stops involved one of the 14,070 black people in Ferguson, which means that each black person is stopped on average 0.7 times in two years (9,875 / 14,070 = 0.7, although in reality, this number is definitely higher, because the 14,070 people include children and others who don’t drive, but that’s OK for calculating the difference between the probability of being stopped for black and non-black people). 1,735 vehicle stops involved one of the 6,930 non-black people in the city, giving an average of 0.25 stops per two years (1,735 / 6,930 = 0.25, again children and non-drivers included here). Now that we have an average number of vehicle stops for black people and one for non-blacks, we can simply divide one by the other to see how much more likely a black person is to be stopped. We find 0.7 / 0.25 = 2.8. This means that a black person is 2.8 times more likely to be stopped. Note that we can do this calculation even if we don’t know how many people were actually stopped. We can now do the same calculation for each of the other numbers in the DOJ report. Blacks account for 95% of Manner of Walking in Roadway charges : blacks are 9.3 times as likely to be charged with Manner of Walking in Roadway. Blacks account for 94% of all Failure to Comply charges : blacks are 7.7 times as likely to be charged with failure to comply. Nearly 90% of documented force used by FPD officers was used against African Americans : blacks are 4.4 times as likely to encounter use of force. Blacks account for 100% of dog bites: : blacks infinitely more likely to be bitten. Blacks account for 96% of cases where someone was arrested by FPD only because of an outstanding municipal warrant: blacks 11.8 times as likely to be arrested because of outstanding warrant. Of course, it was already clear that the numbers in the DOJ report showed that the FDP is a racist institution. But I think that using percentages doesn’t reflect just how horrible of a situation it is in Ferguson. 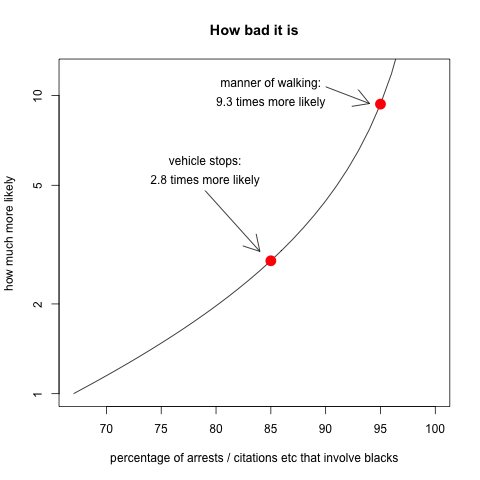 If black people are more than 9 times as likely to be charged with “Manner of Walking” or almost 12 times as likely to be arrested because of an outstanding warrant, it really means that on a daily basis, black people have to fear things that white people rarely worry about (and this is not even including the fear of being killed by the police). They are threatened every day by the very people who are supposed to protect them. For those of us who have never lived in such a situation, we can not know how it is, or how we would react if this were to happen to us. The numbers only tell a part of the story, but it’s an important part. We should make sure we understand what they mean. The percentages in the DOJ report should make clear to everyone that things are horrible in Ferguson, but if we want to appreciate exactly what these numbers mean, it may be better to calculate “relative risks” that tell us how much more or less likely something happens to a black person than to a non-black person. Thanks to Andi Gros and Becca Meredith for reading and commenting on an earlier version of this post.